Jo Yapp's side trailed 14-7 at the break, with Canada scoring converted tries through Brittany Kassil and Gabby Senft, while England responded through Rosie Galligan with Ellie Green converting. Elizabeth Crake crossed for England which Lizzie Goulden converted but Canada scored three second-half tries through Taylor Black, Olivia DeMerchant and Alysha Corrigan as well as three Irene Patrinos conversions to seal victory. The match was a second for England National Academy having taking on United States Select last week. 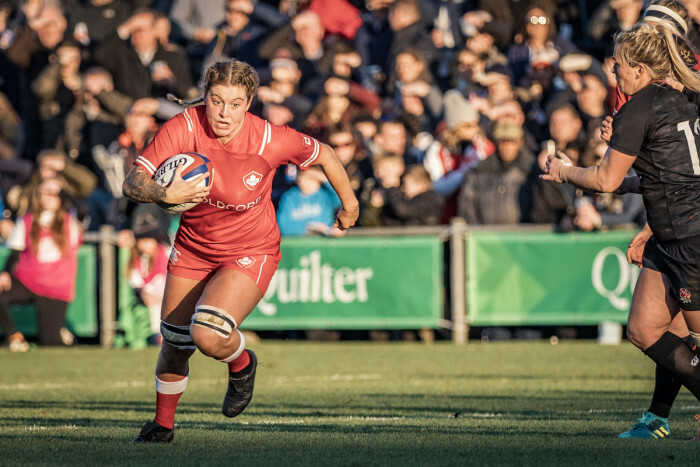 Canada were first to strike in Cobham, as Kassil charged over after a period of sustained pressure, while Senft also bundled over off the back of a scrum and Irene Patrinos’ second conversion took the score to 14-0. England came fighting back and Galligan crossed for a deserved try after cutting a fine line to sear through Canada’s defence while Green’s conversion reduced the deficit to seven points at the break. Black scored Canada’s third after flying through before England's Crake powered through for a fine individual try to reduce the score to 21-14. DeMerchant bundled across for a fourth try, while Corrigan went over in the corner in the final action of the match. “The girls really stepped up from last week, and although the result didn’t go our way the actual intensity and physicality of their performance is something they should be really proud of,” said Yapp.